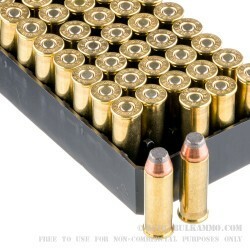 This ammo is manufactured by Remington and is a good choice for self-defense ammo loaded with its JSP bullet but it is also priced reasonably enough that it's a good choice for range practice as well. 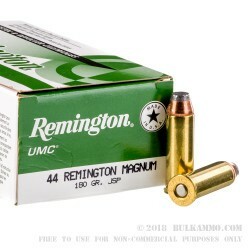 For those that like to practice with the same round they'd choose for self-defense, Remington's 44 Mag ammo is a great choice loaded with a 180 grain jacketed soft point bullet designed to expand on impact. With a muzzle velocity of 1,610 feet per second this round has a heavy energy out of the muzzle at 1,036 ft. lbs. 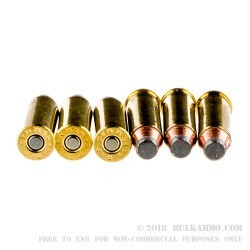 In comparison to many popular 9mm self-defense choices which are below 400 ft. lbs. this is a very heavy hitting round. 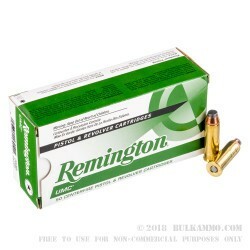 Remington manufactures this ammo in Lanoke, Arkansas where their ammo undergoes a heavy litany of inspections throughout the process to ensure that this ammo is reliable in a wide range of firearms. In fact, in addition to regular gauge testing with micrometers and the like, Remington has a huge assortment of firearms in every caliber to function test their ammo at their indoor range to help ensure that when you get out to the range you can have the confidence in the Remington name. I've trusted the Remington line of ammo for most of my firearms. In all my years of sport shooting, I've yet to be disapointed in the product line. I rate it amongest the best available anywhere.